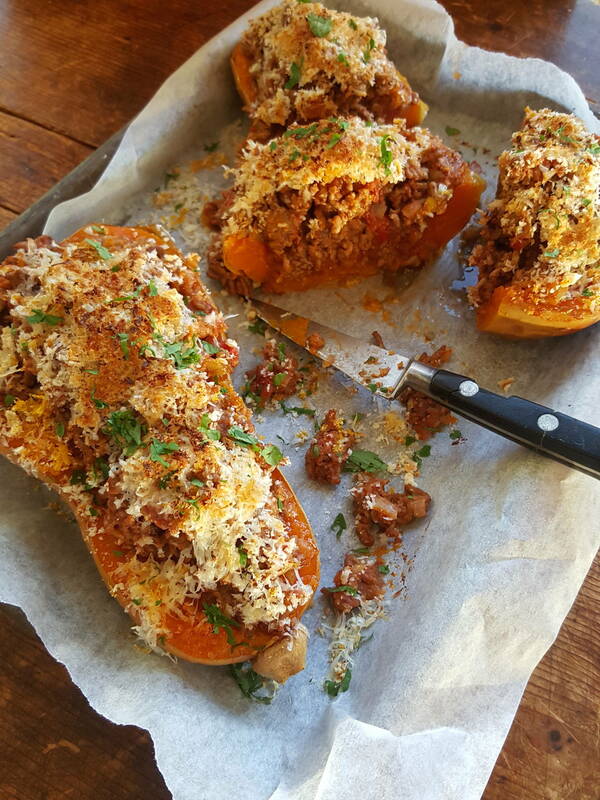 Stuffed butternut pumpkin is an easy midweek dish. 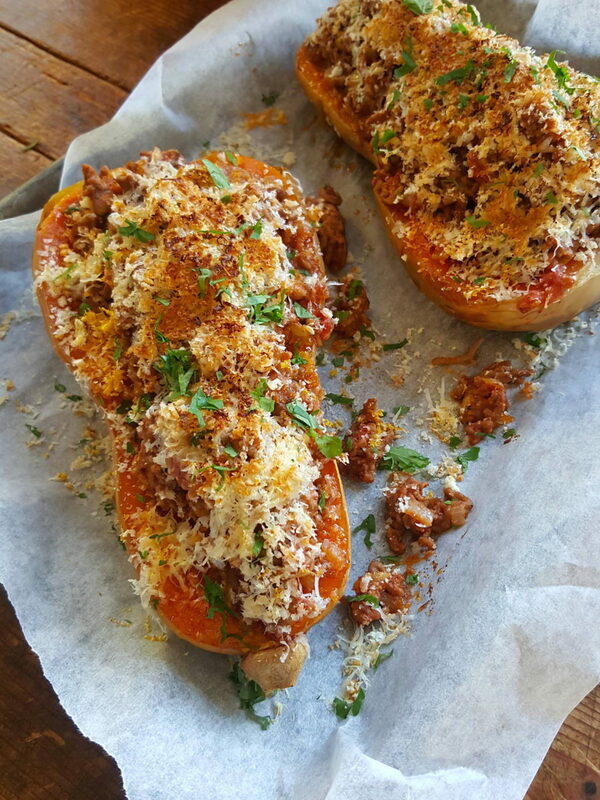 Stuffed Butternut – bring it on midweek! Here's how to make a little meat go a long way. 1 Preheat oven to 200°C (400°F). Remove mince from fridge. Wash pumpkin, then cut it lengthways with a sturdy knife. Lay pumpkin halves cut side down in a shallow roasting tin (line the tin with baking/parchment paper for easy washing up). Cook for 30-40 minutes, until tender when pierced with a skewer. 2 Heat oil in a medium-sized frying pan over a medium heat. Add butter and add onion when it is sizzling. Cook for about 12 minutes, until golden; stir often, especially towards the end of cooking when the onion starts browning. Tilt pan, gently press onion with the back of a large spoon to squeeze out a little oil and butter, and transfer to a side plate. 3 Reheat pan until quite hot (you can see a heat haze above the pan). Add meat in clumps, but don’t stir – let it brown – then flip it over and break apart with a wooden spoon. Add garlic, rosemary, paprika, cumin, allspice and salt and pepper. Stir well, then mix in tomatoes. Bring meat to a bubble, lower the heat and cook gently for 12-15 minutes, until lamb is cooked through and most of the liquid has evaporated. 4 Once pumpkin is tender, remove from oven, turn carefully and scoop out seeds and seed fibre with a spoon (if there is liquid in the dish, pour it off). Season pumpkin with salt. Preheat oven grill. Spoon lamb mixture into pumpkin cavities and on top of pumpkin. Mix lemon zest, parmesan and panko crumbs and sprinkle over lamb. Grill until golden. Sprinkle with parsley and serve. Read all the notes about minced (ground) meat here. Chop chop ... get a decent knife and use a steady chopping board.